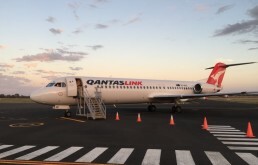 As a wholly owned subsidiary of Qantas, Network Aviation pilots and crew are committed to delivering high-class air services to our valued customers. Please note the information provided on this page is for charter flights departing from the Network Aviation Terminal only. If your flight number begins with a “QF”, your flight will be departing from the Qantas Domestic Terminal and further information can be found on the Qantas website by clicking here.